Good for me but bad for Filipinos in general. 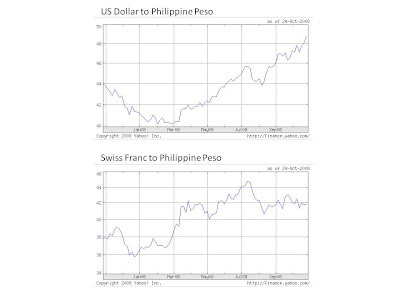 Our peso have lost everything it has gained this year. The one thing I am wondering about is why is it that the USD is high when I have no USD! If you still have a job and is not affected by the financial crisis then this is a good time to visit the Philippines! exchange rate in Korea is too expensive too! graveh! my first time here and i find your blog very interesting...keep up the good work! But you have CHF... not bad either,no?